This restaurant was closed far too long and was missed by many patrons of the area. I am happy to report it has reopened Wednesdays through Mondays. The restaurant has been cleaned up nicely, and although much the same as the old “Espresso” there are subtle differences in the new surroundings. 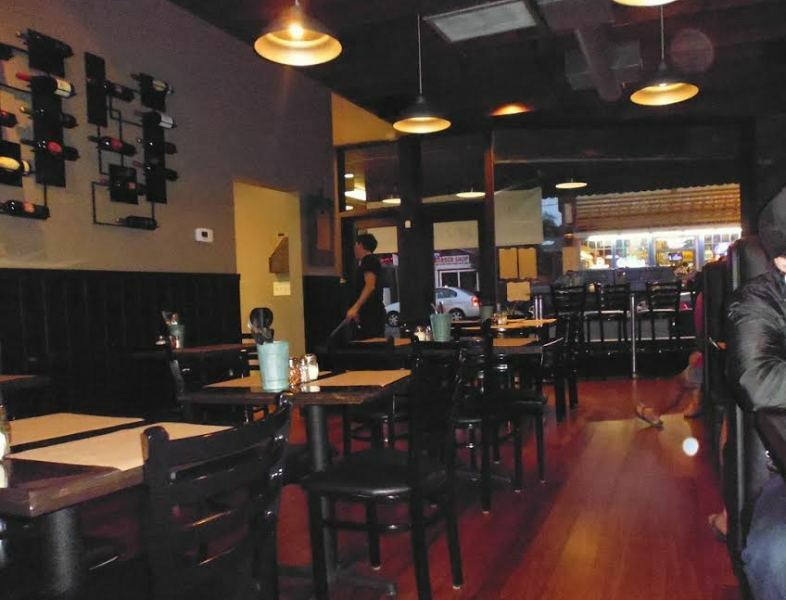 For one, it looks much cleaner than the old restaurant; it has a little more ambiance than it used to. My friend and I were shown to the last booth in the back of the restaurant, where the music was louder than we liked and the air conditioner was on. We asked our waiter, Eric, to try and turn the music down and the air off, and he came back and said that he actually turned the air up, and it would be more comfortable shortly. It was. He also turned down the music. After looking at the menu – Salads/Soup; Sandwiches; Pasta; Entrees and a “Create your own Pizza” my friend ordered Spaghetti and Meatballs – two large meatballs with marinara sauce – $12 and I ordered the Fettuccini Chicken Alfredo – Chicken, butter, Parmesan cream sauce for $14. We were served fresh rolls and butter almost immediately after being seated. My friend said that the spaghetti was cooked properly and seasoned well. He enjoyed the meat balls; said that they had a nice texture and flavor. The Fettuccini was very tasty with a slight garlic taste; served hot with strips of chicken on the top. Not only was the Fettuccini good, the chicken was light and tender. While we were there, there was an active “take-out” the entire time. The tables were approximately 1/3 full, and new people were coming in all the time. Our waiter was very accommodating, and even offered to go next door to get me an iced tea, which they did not have in the restaurant. There is a beer and wine list – whites and reds, with many from Italy and at least one from Napa Valley. Our total bill was $33 and we left an $8 tip. Yes, we would go back again. We enjoyed our food. Judi – This is so great to hear. The old Espresso was definitely one of the best pizza places in OB. Good to hear Judi, did you happen to notice if the $2.00 pizza slices to go returned? I’ve always enjoyed Expresso and living around the corner made busy nights easy with the slices to go. Mari, I just spoke to the restaurant personnel and at this time they do not have slices. They may have them later, but not yet. Since the reopening, I have been there twice. Great food & service. I got the Ravioli Plate & the House Salad both times. I also like the new look & the atmosphere as well. Definitely worth it!